BASIC, What Day Is It? 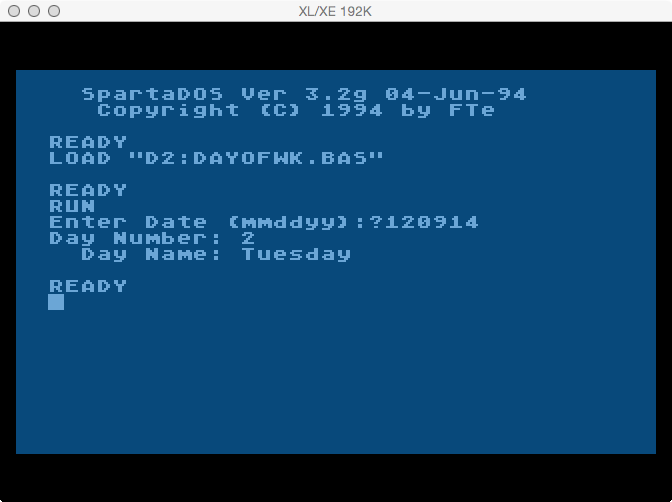 Can a 30 year old 8 bit computing platform determine the day name for days past Y2K (year 2000) in BASIC? Sure, with a few lines of code! As it turns out it was actually very easy to do. 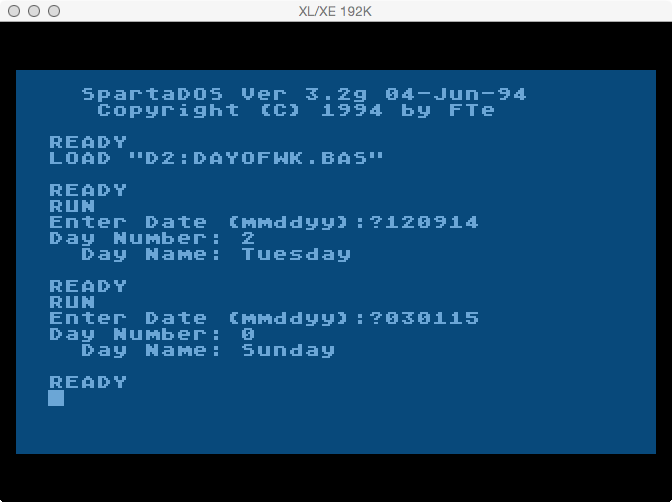 Using the first (table) method on the Wikipedia site I was able to create a simple BASIC program to correctly compute the day name for any date in the 21st century (2001-2100). 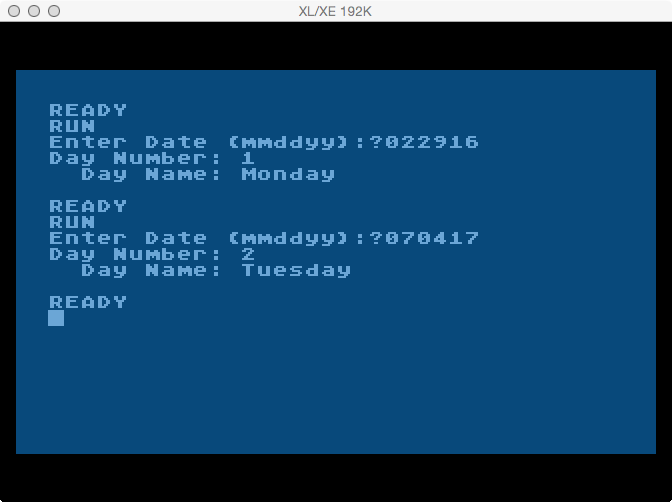 More correctly this program works with dates from 2000 to 2099, so I’ll refer to it as the 2000’s. m = corresponding month number. This is a magic number so to speak and not the actual month number. It represents a grouping of corresponding months, which are months that start on the same day. Note that January and February have different values on leap years. c = century number. This is one of 6, 4, 2, or 0. It’s 6 if the first two digits of the year are evenly divisible by 4. Then each century after follows in 4, 2, 0 order. The result is a number from 0 to 6 which represents the day of the week starting with Sunday (0) and ending on Saturday (6). Rather than list all the tables, please refer to the Wikipedia entry. They are listed in the first section which is the tabular method. Line 265: Determine if year is leap year by computing the equivalent of y mod 4 and store the result in variable L. Take the integer portion of the year divided by 4, then multiply it by 4, then subtract the result from the year. If the result is 0 the year was evenly divisible by 4, and is a leap year. Line 290: Perform the computation of the mod 7 part of the formula on variable C. Take the integer portion of variable C divided by 7, then multiply it by 7, then subtract the result from variable C and store the result in day of week variable DW. The result is the day number of the week starting with Sunday (0) and ending with Saturday (6). Line 320: Read each days name value in a loop and store it in the day name string variable (DN$) until the loop hits the value of the day of week value DW. At completion DN$ will be defined as the day name that corresponds to the day number. Line 360: Print the day of week variable (DW) value, just for reference.